Tsering Gurmat, Sculptor: Art is something which is practical in nature and is interesting because when someone draws or carves a new figure a thing is produced. The composition of art is one of the most interesting things in this field where we can create what we imagine and think about. I was good at painting from childhood and after my schooling one of my teachers suggested me to choose fine arts as a subject. Accordingly, I went to Jammu and pursued Bachelor in Fine Arts from Jammu University and Master in Fine Arts from Banaras Hindu University. During my college days, I made many decorative things with waste material such as leftover tiles, stones etc. I am a contemporary artist and my work has a touch of a traditional element. I create modern things with the blend of certain elements which gives the originality of Ladakh. My specialisation is in stone carving and focus is to create art out of the rock which is the main medium on which I work upon. Besides that, I also work on other different mediums such as wood, metal, fibreglass etc. In Ladakh, the availability of stone is in abundance which is one the reasons to choose it as a medium to work. When I say in abundance, it does not mean to harm nature while collecting it. I collect stones and assemble them to create visual art such as decoration things, stupa, figures etc. I found that we can do many things with the rocks of Ladakh. In 2014, I worked on the theme ‘Wishing tree’ at LAMO center. The tree is made of all metal scrap. I also worked on Col. Rinchen statue under the guidance of my teacher Rawinder Jamwal, a stone carved stupa at Hotel Apricot tree, a model sculpture of Kushok Bakula Rinpoche and many others. From my work, I am trying to communicate and inspire others about the art formed by the composition of materials which are waste materials and of no use. There are many artists of Ladakh who are working in different field of art and craft. But unfortunately, our people prefer to engage outsiders more in works. This is one of the main reasons why new artists are reluctant to come in this field. The art, craft, and architecture built by an outsider somehow will be different from the local artist. If an outsider carves the face of a Ladakhi he would not be able to do it perfectly as done by a local artist. In every school, art and craft classes for students is very important because it will be easier for children to learn things and add to their creativity. This will also help the children in recognising their inner skills to work in life. The art, craft, and culture of Ladakh need to be given more preference and importance along with the modern architecture and crafts, because if we fail to focus on it then it can impact the identity and culture of Ladakh. If we welcome each and every new thing without analysing, the essence of old tradition and culture of Ladakh will vanish one day. Ladakh will be same as other places of the world and there will be no more importance left to this region. The main public spots can be decorated with our own arts, for eg. the chowk can be shaped and decorated with our traditional art and architecture. In every school, art class should be imparted so that it adds to their creativity. Need to encourage the local artist more as compared to the outsiders. With modernisation, artists should compose new shapes and designs keeping the essence of traditional art form intact. Dorjay Dadul, Wood Carver: The traditional art of woodcarving is popular in Ladakh. Woodworks are used in our society for different purposes such as tables (Chog-rtse), Door, wooden lentils etc. but I work mostly on things which are used for religious purposes such as Zhuk-thri, Zhuks-khang, Las-khang, Solchok etc. Focusing on preservation we mostly work on the traditional art descended from our ancestors which are mostly used and seen in the interiors of the monasteries. I prefer to work on traditional art because of its value and importance. Today, most of the artists use machines but we prefer to do the hand carving as the actual art and painting depicted have no comparison with the machines. The art on which we are working on today will become valuable after a few decades when such hand carved works will be very rare to be found. I have been working for many years but until today, I didn’t see the special art of Ladakh itself. I think our ancestors have learned it from the Chinese artist. The carving that we are doing today is the combination of two arts that is Gya-zho and Phot-zho. Gya-zho is an art which came from China and Phot-zho came from Tibet. There is a little difference between the two in shapes and designs. The artists of Ladakh work with these two. There are many things to know from each carve in which we depict designs, symbols, and figures. Different designs and symbol are carved for different religious purposes and according to the status of a person. There are lines and symbols locally called Rimo which can be carved according to the nature and ground of the things. There is a need to have a skilled teacher in all the training center be it government or private so that the younger generation can learn about it very successfully and the story of the art can be written in books through which the artist can learn and know about what he/she is carving. Along with carving, drawing and painting are very much necessary for an individual because if we know the painting one can compose anything and carve it accordingly. The younger generation should take interest in this art form and work on its preservation because today we have a teacher who has knowledge about it but if we don’t carry it forward, this art will die after some decades. 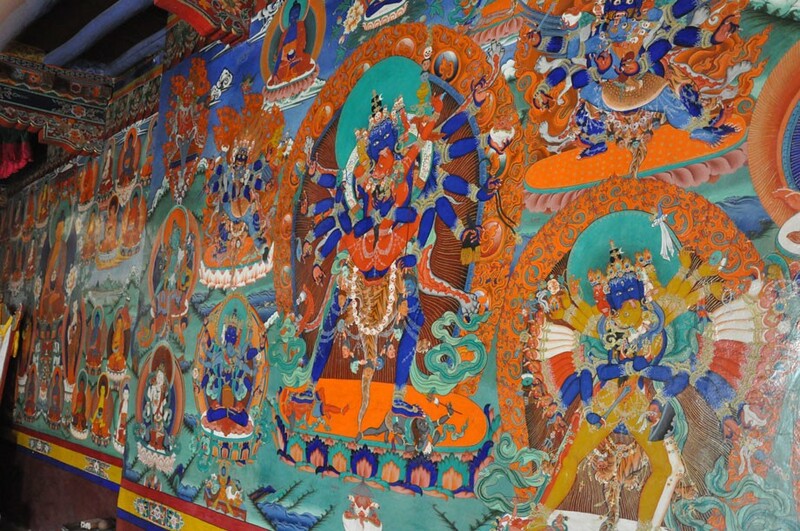 I have worked in many monasteries such as Thiksay, Diskit, Tangtse, Saboo, Hemis etc. and the only thing in my mind is that the work I am doing today will become the most valuable things after many decades. There is a government training center at the district level but people don’t go there to learn because the teachers they have recruited are not skilled enough. If we really want to promote and preserve this art, then there is a need to recruit teachers who are well qualified and skilled. In the past years, with the introduction of machine-made products people became more inclined towards it. We see many kinds of wood carved things from Saharanpur which is way too different from our own handmade things in terms of quality and durability. But today, the day has come again where people look for handicraft things. We get demand from foreign countries because they know the value of handmade and art of Ladakh. So the scope is there but the need is to work on it. The design and symbol in every woodwork have a story behind it but most of the artist doesn’t know about it as they have only learned about how to carve. The story of each art, design, and figure needs to be written so that the younger artist can tell the story along with carving, painting etc. There is a need to have a skilled teacher in the training centers. Need to strengthen and encourage the skill of everyone. One should protect the traditional art and its originality. We should not mix the two.